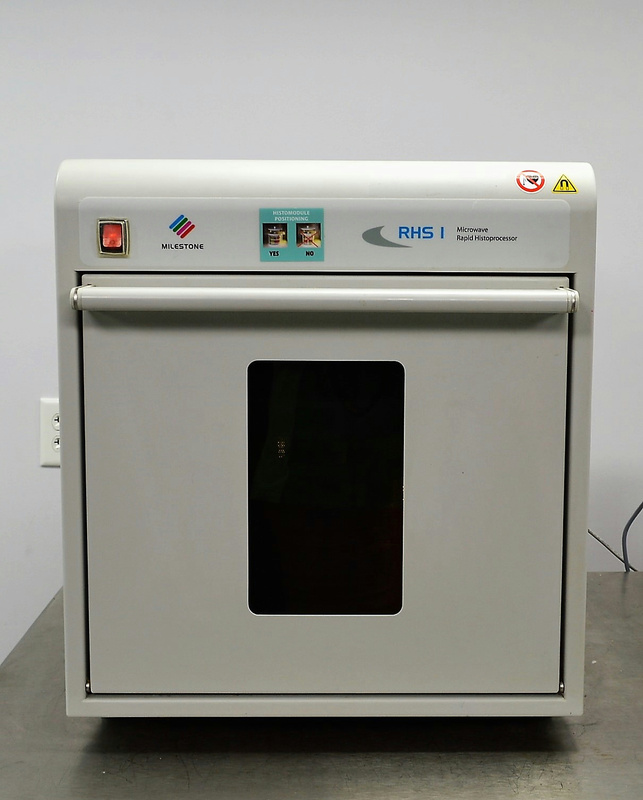 Milestone RHS 1 Microwave Rapid Histoprocessor & Cassette Vessel Pathology . New Life Scientific, Inc. The RHS Tissue Processing Systems will reduce processing time to 1/3rd of the time required by a conventional tissue processor. The quality of the tissues is outstanding and consistent. You can now process all tissue types simultaneously, with one program. The system is virtually maintenance free and is ready to go whenever you are. Imagine the tremendous benefit of reduced turnaround time for your lab, and for a patient. Not only will you be able to produce same day results, the RHS System needs just one environmentally friendly reagent and paraffin to get the job done. No more xylene, no stockpiles of reagents to accommodate in your lab. The Milestone RHS-1 microwave is in good working and cosmetic condition. New Life Scientific technicians examined the instrument and it is verified to be functional. The technicians inspected the electrical connections and cables, powered the unit on, and observed that all power lights and fans operate. The control modules built-in computer (available separately) and software were booted and began the initialization process. The technicians accessed the service account and performed both vacuum and microwave tests; the microwave power functioned as intended. The temperatures were calibrated and the switching terminals were inspected. After multiple examinations were performed on this instrument, the technicians concluded that it is functional. Please contact New Life Scientific and the links provided for more product information. **The control module and vacuum module are not included.